I’m pretty sure my comments about there not being snow last week prompted a nice little storm that rolled in last night. Therefore, I’m ecstatic, but my tentative plans for a trail run this weekend fell through and I decided to run a nice easy in-town route at Virginia Lake. First, a little background on Virginia Lake. The lake is located in the middle of Reno, and was initially constructed in the 1930’s for the purpose of being a recreational lake. It is about 12 feet deep when it is full and covers roughly 24.5 acres. It’s primary purpose when constructed was for fishing and it is still stalked annually with Rainbow Trout. Therefore, you usually will see some people fishing along the banks or the more common than not… bird population. 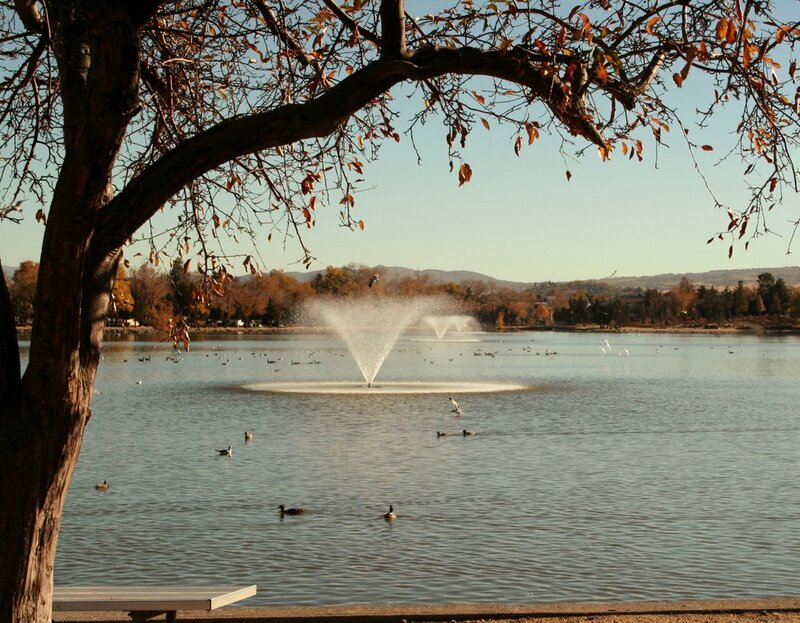 Managed by the City of Reno and designated as Virginia Lake Park, it is known for “lunchtime strolling, walking the dog, bird watching…” and of course, running. It also includes a nice dog park and playground for children at the Southwest Corner of the lake as well as a fitness area at the most northern point. The trail loop used for running around the lake is exactly 1 mile long, which keeps it nice for tracking distance if you don’t feel like carrying your phone. I typically start at the north end of the lake as there is a decent size parking lot located next to the fitness area, but you can pretty much park anywhere around the lake right next to the running path. It is a nice easy loop for running and probably the best on a sunny summer day. I typically see a bunch of people walking their dogs, feeding the birds, or jogging around when I’m there. Today, however, it was snowing, so I felt like I had it all to myself. This route is also another gem in Reno that you run by during the Reno Tahoe Odyssey relay. In fact the last leg of the relay runs along the west side of the lake on the way towards the finish line. It’s pretty nice when you reach this part of the final leg, since you know you’re almost done and you get to enjoy a little bit of Reno as you run by the birds. Check out a map of the area here. Make sure you check this one out, even if it is just for a stroll at lunch. Feel free to leave a comment and tell me what you like about it! Last year was the first year I participated in Race 178’s Annual Leprechaun Race. I hadn’t thought much about participating in the race before then because I focused more on running longer distances and a 10k race was probably the shortest I would normally run, but I found this 5k race to be very fun and exciting. This year will be the 3rd Annual Leprechaun Race and it will be held on Sunday, March 15th. I guess if I had participated a year before I could call myself a Leprechaun Race veteran, so I missed out on the fancy credentials… but oh well. There is a bagpiper to serenade you at the start line and the event definitely presents a great St. Patrick’s day theme with tons of people in costume, music, vendors, and prizes for age group winners. The race is located in Midtown Reno and begins and ends at the Discovery Museum at 490 South Center Street. 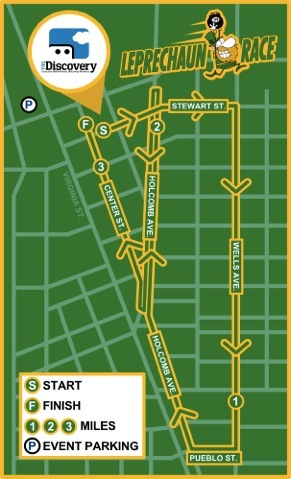 The race course brilliantly showcases one of Reno’s main St. Patrick’s day celebration venues, Wells Avenue, as well as the local eateries and bars of the Midtown District. This Midtown area of Reno has definitely boomed the past several years and it is fun to run a nice 5k course through the heart of the area to see all of the new development. The event is given the title “Leprechaun Race” not just for a catchy race title that happens to coincide with St. Patrick’s Day, but because you actually get to race a Leprechaun (a.k.a Lenny the Leprechaun) . Well, he is not a REAL leprechaun (he was way too tall), but the cool thing here is that if you beat him, you win a prize. *Spoiler Alert* you will win an awesome pilsner glass that you could enjoy your post race St. Patrick’s day beer in. Therefore, there shouldn’t be any issues with motivation here if you plan to enjoy a St. Patty’s day beer anyway. Speaking of beer, there will be a post-race beer garden at Ceol Irish Pub immediately following the race, if you want to get your St. Patrick’s day celebration started early. The beer garden doesn’t have free beer, but you pretty much pass the celebration on your way into the finish line, so it’s just a quick walk or cool-down jog from the finish line at The Discovery Museum to your victory beer. I hope everyone can make it there! Feel free to share any thoughts from the event that you think will make a newbies first Leprechaun Race that much more special! So with all the business at work this week, I didn’t have a chance to explore a new running trail, but it has been unbelievably sunny, warm, and beautiful in the Reno Tahoe area (which is slight depressing, since it’s February, and I want to see some snow this winter). However, given the beautiful weather, I decided to run a nice favorite route of mine along the Truckee River Bike Path through downtown Reno. A portion of the path can also be referred to as the Reno Downtown Riverwalk, with the entire length of the path at approximately 12 miles, following the banks of the Truckee River from Idlewild Park in Reno all the way to the Eastern end of the City of Sparks. I modified my route a bit as the path actually extends West about four miles past Idlewild Park, all the way down to Mayberry Park, which is where I started my run. Mayberry Park to Downtown Reno, approximately around Wingfield Park between the Arlington and Virginia Street bridges, is about the distance of a 10k (or 6.21 miles). This is a great route to take if you want to get in shape for a 10k, but you can modify your run accordingly depending on what you’re in the mood for, as there are many places to enter and exit the trail. Starting at Mayberry Park and running to downtown Reno, there isn’t a significant change in elevation and it is a very nice easy route to take for either solo runs, group runs, or even biking. I don’t think I’ve ever run this route without seeing at least one other runner or a group of runners enjoying the same area. It is also very well maintained and pet-friendly, which is something I definitely appreciate (reference my aversion to running with a bag of warm puppy poo from my previous post). The path has 1/4 mile markers too, which are pretty nice if you like a visual indicator for your pace and you don’t run with a GPS device of some sort. 1) The start line of the Reno Tahoe Odyssey is actually in Wingfield park, where I ended my run, and takes the opposite direction going West towards Mayberry. This relay is pretty amazing as it goes 178 miles around Lake Tahoe, Carson City, and Virginia City coming to an end on the same path at Idlewild Park. 2) The Downtown River Run hosted by Reno 5000 runs along this route as part of their Marathon, Half Marathon, and 10k events giving runners a great experience through Downtown Reno and all of the Truckee River path. 3) The Great Basin Brewery 4-person relay, a personal favorite of mine, also runs along this route from the Sparks Great Basin Brewery location to Mayberry Park and back. I would try this relay if you like to have a post-run beer with your friends. I hope everyone has a chance to try the Truckee River path at some point, whether it is in one of the events above or just on your own. It definitely highlights Downtown Reno and the Truckee River, so for anyone that isn’t familiar with the area, I would recommend trying this running route before anything else. If you have a favorite part of the River path you like to run, please feel free to comment and share. Don’t forget to follow my blog for other upcoming run highlights in the Reno and Lake Tahoe area. To get the ball rolling on some great running ideas, I thought I would share one of my favorite “quick runs” in Reno, the Caughlin Ranch Trail. Not to be confused with the Caughlin Ranch Hiking Trail, this running path is actually part of the paved pedestrian trails that are included within the Caughlin Ranch residential area. There are a variety of different trails in this area, but I find the paved pedestrian paths the best for getting in a quick run on a weekday night and it’s a big plus that it is extremely dog-friendly. Although I don’t actually live in the Caughlin Ranch neighborhood (even though that would be amazing, since it is definitely a beautiful area), it’s a short five minute drive for me. Located at Caughlin Parkway, which is at the intersection of Plumb Lane and North McCarran Blvd in Northwest Reno, Caughlin Ranch stretches from the base of the Sierras all the way to the Truckee River. First things first though: distance and difficulty. I wouldn’t rate this path as very difficult, but more of one of the beautiful places to run that isn’t too far out of the way. Starting at the entrance of the Caughlin Ranch residential neighborhood on Caughlin Parkway, you are able to park at Caughlin Crossing, which is the first cross street you come to. You will immediately find signs designating the pedestrian paths. Beginning at this spot, it is approximately 1.75 miles to the top of the paved path for a round trip run of about 3.5 miles. It is a gradual incline to the top with a bit of a steep hill at the very end. However, the path is amazingly well maintained and there is beautiful scenery along the way that makes you hardly notice the incline on the way up. 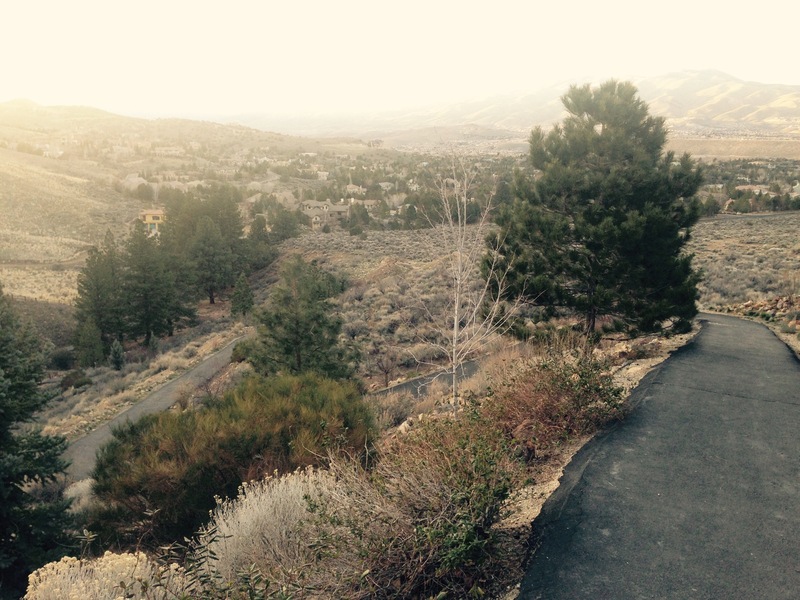 You are able to see most of Northwest Reno once you get to the top of the paved path, so a little victory feeling with a beautiful view is definitely the way to go. If you are training for a long run, this route is also relatively short and incorporates some hills as well. The distance of the run can also vary depending on whether or not you want to start at this same spot. There are a ton of trails in this area, some merging with the Steamboat Trail or following down to the Truckee River, so it isn’t an all-encompassing option when you decide to give it a try. accommodating it is for your canine friend(s). I mean, the trail has a nice little creek that crisscrosses throughout the duration of the path, just in case your puppy gets thirsty and there are plenty of dog waste stations. 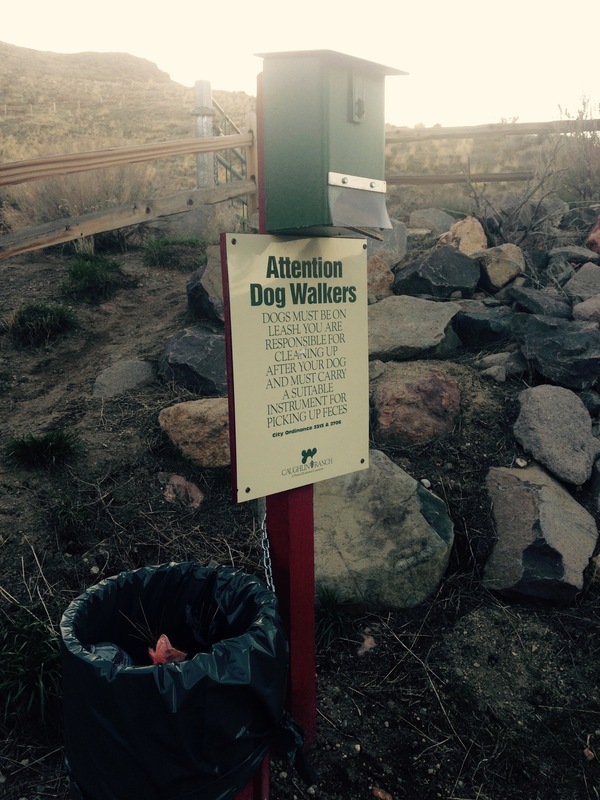 This is particularly exciting for me, because although I’m fond of holding on to a bag of warm puppy poo while I am running, it is beyond words how nice it is to have a trash can available every 50-100 feet. You can definitely tell that people like to keep this path nice for everyone to use and its refreshing to see how well kept it is. If you have the chance to enjoy this quaint running path through the Caughlin Ranch area, please share below. It would be great to hear what you have to think too! As an accountant, I sit at a desk all day, so in order to keep from getting a little pudgy around the edges, incorporating some type of physical activity in my life is a must. I decided a while back before college that running was probably the best thing for me to keep in shape. I used to play football in high school and was part of the Track & Field team, so incorporating running into a weekly routine didn’t seem too daunting of task. Besides, endurance wasn’t ever an issue for me and it felt sort of nice to mix things up from just running back and forth or in circles around a track. Running has since evolved for me from the necessary evil of keeping in shape to somewhat of an obsession. I don’t run to boast some sort of persona that I am an all pro marathoner or feel some intense passion from encouraging others. I run simply because it is enjoyable and something personal for me. I have run 6 marathons, more than 15 half marathons, and participated in a number of relay events. Most of which, have been in the Reno or Lake Tahoe area, which is where I grew up. I have come to appreciate the beauty of running in this area and enjoy the vast amount of running trails, paths, events, and running groups the community has to offer. Whether I am participating in a local 10k through downtown Reno, running the Lake Tahoe marathon, or just going out on a Saturday morning jog with my dogs, there is always a new route or trail to explore. My goal is to share these amazing running routes and events with other interested runners and give a little insight on what Reno and Lake Tahoe have to offer as running communities. I hope you enjoy my blog!